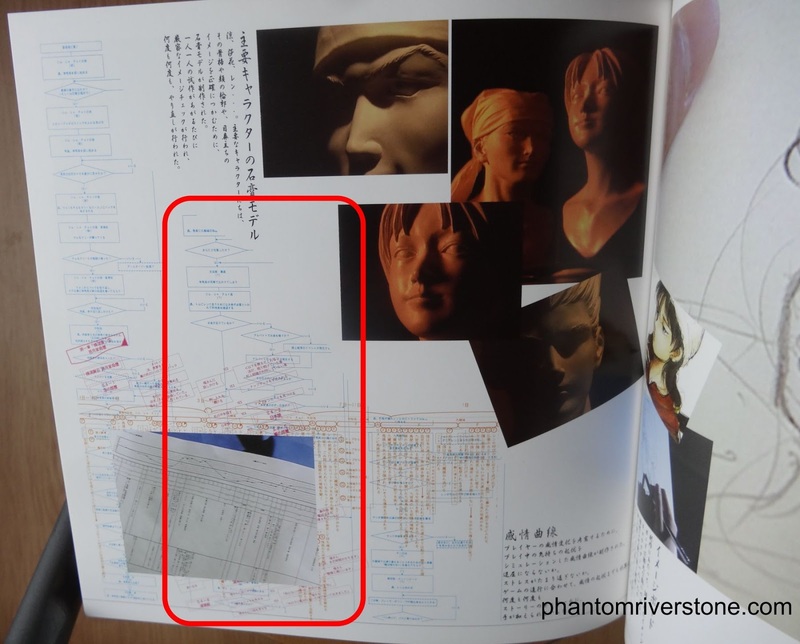 The top step of the flowchart, which appears to be a continuation from an unseen section, is partially obscured, reading"Akira ... [obscured] map of Kowloon from Xiuying". Possibly Ryo asks for (or receives) such a map from Xiuying. Following this is a check to see whether Ryo has completed "two more round trips" - my guess is that this refers to Ryo carrying books outside to air them in the rear yard of Man Mo temple. He needs to perform this task two additional times before the next part of the story is triggered. Once Ryo has carried books outside twice more, Xiuying leaves the temple grounds to go on an errand, leaving Ryo free to temporarily abandon his task - he heads to the harbor area. At the harbor, he attempts to find Ren but is told that it will cost money. Map of Kowloon: possibly a map showing the way to reach Kowloon, or a map of part of its streets. This doesn't appear in the released game. At this point in the story Ryo is not supposed to have learned that Yuanda Zhu is located in Kowloon, so it is puzzling why this was included. Xiuying's errand: the ability for Ryo to abandon the book airing is is an interesting difference compared to the final version of the game, where you are constantly under the watchful eye of one of the temple workers, Jiliang Chang. The character who tells Ryo about the monetary requirement for meeting Ren is named as "Tom" in this flowchart. This could either be a mistake or else it was reusing this name for a minor henchman of Ren's gang. In the released game, it is Sam who informs Ryo about this. After Ryo is informed about the cash donation to Ren, the game checks whether he is carrying enough money. If he isn't, he is given a choice of two ways to earn money: either taking a part-time job or gambling. The appropriate event then takes place. At the end of the day, another check is carried out to see whether he has earned enough. If he has, the main story continues as if he had been able to pay immediately. This section of the flowchart matches the final version of the game. 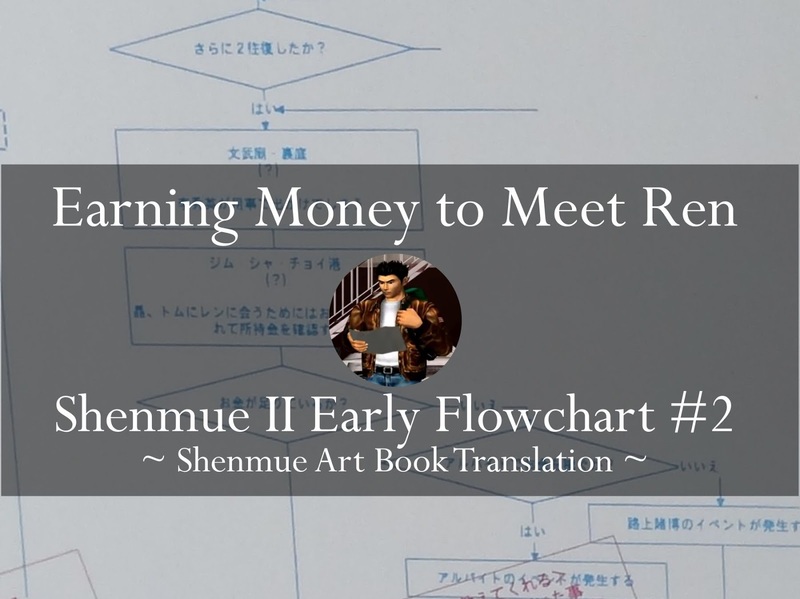 If Ryo hasn't earned enough money to pay Ren, the game checks to see whether this is his first day for airing out the books. If it is, then a check is also made to see whether he manages to get back to Man Mo Temple by 5 pm. In the case he doesn't, there is a special additional scene where he has some sort of quarrel with Xiuying. Although the following part of the flowchart is obscured by another image, it looks as if the flowchart lines return to the previous part of the chart i.e. Ryo will have a chance to sneak out again the next day to earn more money until he has enough. Back by 5 pm: this check reminds me of Shenmue I, where Ine-san has a word with Ryo if he gets home late at night. In this case, presumably Xiuying uses much stronger words to scold Ryo for not taking his book-airing task seriously! (However this scene could only have been seen on the first day). After an obscured section comes a final small snippet that indicates that Ryo becomes caught up in another fight with Sam, Larry and Cool J (Cool Z). 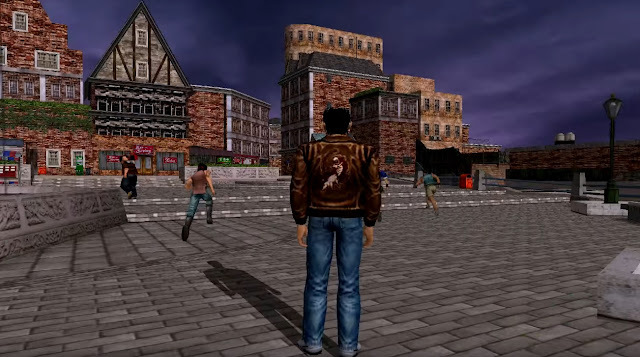 In the final version of the game, once Ryo has paid Ren promises to lead him to Yuanda Zhu but this turns out to be a trick and Ryo is forced to hunt and chase the gang in order to make Ren live up to his promise. The fight mentioned in the flowchart snippet above may have been the original plan, which was replaced with a chase sequence to give better gameplay variation. In the final version, there is a scene where Ryo picks one of the gang members to chase. One of the most interesting differences was allowing Ryo to escape his book-airing task and go down to the harbor, whereas this does not happen in the final game - perhaps it was felt that this would be disrespectful to Xiuying and weaken the value of the lesson. But I would have liked to see Ryo get scolded for returning back late! Especially for our blog readers, we are currently working with Retro Import Gamer to arrange a special discount! Details will be updated here soon, or watch out for an announcement on our official Twitter.